This Cruise-and-Learn Sailing Adventure is a 6-day, 5-night live-aboard class. You’ll gain the skills and knowledge necessary to feel capable and comfortable at the wheel of a cruising yacht. This certification (through American Sailing Association) enables you to charter boats up to 50 feet, anywhere in the world. This trip includes all instruction and materials; 5 nights accommodation aboard Splendid Adventure, our Beneteau 393; all breakfasts, lunches, and two dinners aboard. Lanier Sailing Academy has been teaching sailing for over 46 years. That makes us the OLDEST CONTINUALLY OPERATING SCHOOL IN THE SOUTHEAST. Our instructors are experienced specialists in training and certifying students. 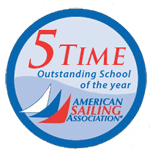 We have been frequently awarded ASA’s “School of the Year” and “Instructor of the Year”. We look forward to helping you fulfill your sailing dreams. Check in and board Splendid Adventure in the afternoon. Enjoy refreshments as we get to know each other, our vessel and the cruising grounds. We’ll have dinner ashore, then finalize our duty roster and sleep aboard at the Marina. First things first: we’ll get everyone comfortable at the wheel, while we practice docking skills. Next we’ll get to know Splendid Adventure under sail and explore Pensacola Bay. Then it’s on to Big Lagoon, for a great seafood feast at this beautiful anchorage. Now we weigh anchor and set our sights west along the Intracoastal Waterway (ICW) towards the Perdido Key area. Today we will practice our navigation skills, heavy weather sailing techniques, and work on our “crew overboard” recovery. Tonight we’ll dock at Bear Point Marina, then off to a delicious dinner at one of Orange Beach’s popular restaurants! After breakfast we’ll review & take the 103 certification exam. Before you know it, we’ll be underway for Perdido Bay. This beautiful unspoiled area has wide open back bays to explore as we hone our sail trim skills. Tonight we’re on the hook at Pirate’s Cove or maybe a new pirate hang-out of our own making. Now we’re ready for the open sea, so it’s out Perdido Pass into the Gulf of Mexico’s turquoise waters. After a 14-mile voyage east, Pensacola Pass will welcome us back to protected waters. Depending on weather & the crew’s desire, we’ll dock back at downtown Pensacola or perhaps anchor off of Pensacola Beach. After dinner the captain will entertain questions for tomorrow’s 104 exam. We’re early to rise for breakfast, then relax on deck to take the 104 exam. We’ll discuss what to expect when you do your first “bareboat” charter. Then it’s up to the capable crew to get the captain & vessel home safe and sound, as we refine everyone’s skills. Finally, it’s back to home port, relaxed, confident, and ready to charter a boat of your own! ** Air fare, transportation and meals ashore are not included. Lanier Sailing Academy is financially committed to each trip and requires that all students and passengers meet the same financial commitment level. To hold your reservation, a 50% non-refundable, non-transferable deposit is required. Your remaining non-refundable, non-transferable 50% balance is required 45 days prior to your scheduled sail departure date and will be billed to the same credit card unless we are otherwise notified. We recommend purchasing travel insurance.